I inherited Elizabeth David’s A Book of Mediterranean Food from my great-aunt along with several others, including Florence Greenberg’s Jewish Cookery Book and the second volume of Julia Child (from which I have never cooked anything, although my eyes have glazed over trying to read the whole nine page recipe for Progres cake, which Ann Seranne manages to capture in half a page of much larger text. I imagine if I ever want to cook something complicated, it‘ll be invaluable.). Mediterranean Food was Elizabeth David’s first book published in 1950, though I have the 1955 edition, which has jaunty, (now faded) cover art and illustrations by John Minton. David’s influence on Jane Grigson is clear: recipes are interspersed with anecdotes and quotations, assume a moderate level of competency in the kitchen and variations are offered. Slice 2lb of onion and put them in a deep casserole with a half-tumbler of olive oil, a little salt and a pinch of cayenne pepper. On top of the onions place a cleaned chicken seasoned with salt and pepper. Cover the casserole and cook very gently in the oven for about an hour and a half. The onions must not brown , but melt gradually almost to a puree, as in Passaladina. Add a little more oil during cooking if necessary. When the chicken is tender carve it into pieces and serve on a dish with the onions all round, garnished with a few stoned black olives and squares of bread, fried in oil. If the chicken is of the elderly, boiling variety, it can be cut into joints before cooking, so that it will not take so long to cook, although whenever possible I think that chickens should always be cooked whole to preserve the flavour and juices and carved into joints for serving. I modified the quantities to 3 chicken thighs and one medium sized onion. I didn’t measure the oil, other than making sure there was just about enough to very lightly coat all the onion. I think I may have also accidentally used chilli instead of cayenne. I cooked it at gas mark 5 for 1hour before checking it and when it was still a pale sloppy mess, I basted the chicken and cooked it for half an hour longer uncovered, so the skin would crisp up and some of the liquid would evaporate (except neither of those things happened). I was so very excited about this and… it didn’t work. 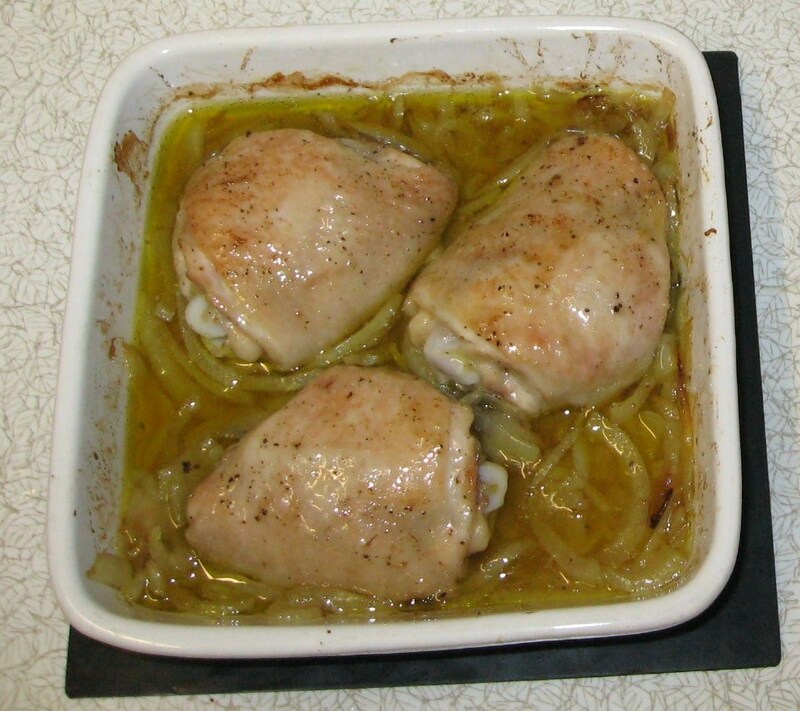 When I took the dish out of the oven, I had pale chicken with damp skin in a green sea of onion slices, olive oil and chicken juice. In order to turn this into something edible, I put the cooked onions (not the liquid) in a frying pan with a pinch of fresh rosemary and cooked them until they browned slightly, then I stirred in half a dessertspoon of flour and added some of the water in which I had boiled the potatoes for mash and half of the olive oil and meat juice mixture from the baking dish as well as a little shake of Worcestershire sauce and left it to reduce by about a third. The chicken had been keeping hot in the oven and I now gave it a blast under a hot grill to crisp up the skin. 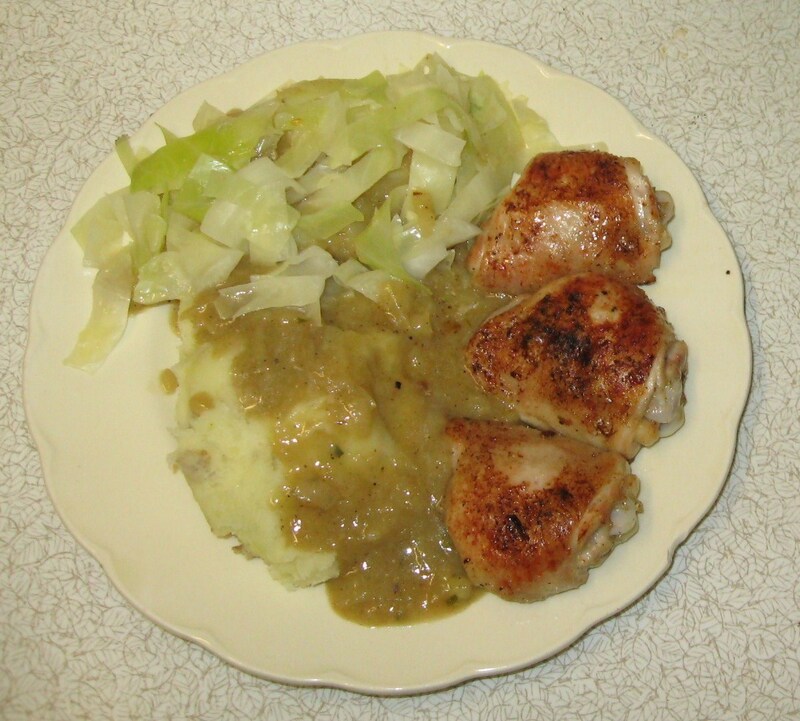 There are adjustments that could be made so that this dish works – the chicken could be browned very briefly before being placed in the oven and the whole dish cooked for much longer. Alternatively the whole dish could be cooked very gently on the hob. Many using a metal dish rather than an enamel one would help the onion cook. I’m not sure when or even if, I will ever try these however, I’m feeling a little jaded.